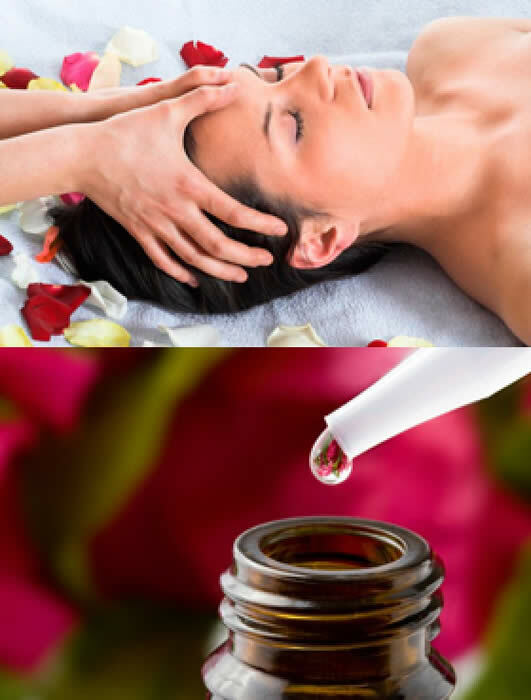 Aromatherapy Massage - Aromatherapy is the use of essential oils in holistic treatments to improve physical, emotional and mental well being. Essential oils, extracted from plants, possess therapeutic properties which can be used to improve health and prevent dis-ease. They have both physiological and psychological effects, when combined promote balance and positive health. These natural plant oils are applied via massage. They are absorbed through the skin and are especially effective with stress-related conditions and a variety of other conditions. Reflexology - Reflexology is a therapy which helps to restore and maintain balance within the whole body by applying pressure to parts of the feet known as reflex areas. The feet and the hands are mini maps of the body's anatomy so all body systems can be accessed by applying pressure or massaging the corresponding area of the foot or hand.The aim is to stimulate the body's own healing process and bring the body back into balance. It encourages the body to rebuild its energy, stimulate circulation and help the nervous system to work more efficiently. Hot towels are used to enhance the effects of the natural products, plus Argan Oil which protects the skin against wrinkles appeared due to premature ageing. It also helps reduce the appearance of crow’s feet (wrinkles under the eyes).